OK. So I’ve forgiven the peep. Just in case you were wondering. She didn’t mean to yell at me and pull me. I know this because when I ran away from Her – as a dear friend pointed out – I actually RAN. Which meant that I can do anything I want to do and I should have wanted to go with Her rather than run away from Her. But She was cramping my style. 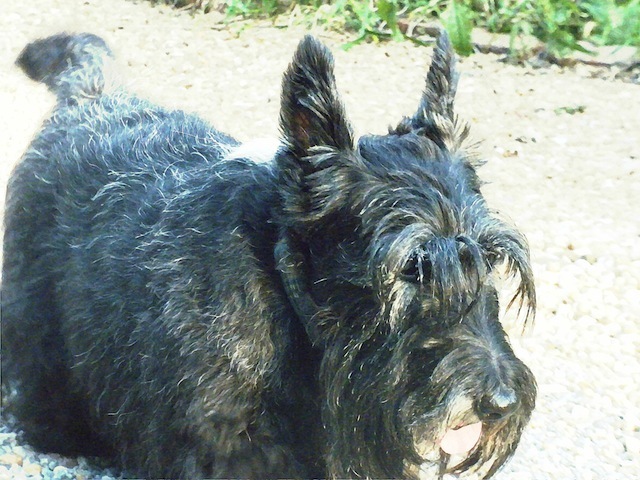 This entry was posted in The Scottie Chronicles and tagged art, dogs, pets, photography, Scotties, Scottish Terrier behavior. Bookmark the permalink. I’m feeling small right about now. Stuart, I snuck out an open door once when we were visiting a friend in Charleston. I just wanted to explore, not get away. We don’t realize how paralyzingly scary this is for our Peeps. Mama was driving around, calling my name, asking pele if they had seen me, and she was getting, let’s just say, hysterical. Don’t quote me, however she said it was WORSE than when PawPaw died. But happy ending..,their was a community wide email system, and after 45 minutes or so, I was located two doors down, partying with a baby Labrodoodle and two cats. I had pushed open their screen door, and could not get back out. Pawty! There was no yelling or pulling, just an immediate call to LL Bean to order one of their collars with my name and phone number embroidered on it..even though I have a chip. If there had been a vodka martini, she would have drained it and immediately asked for another. Be safe, and don’t leave home without her. Now I’m really feeling small. I feel better knowing that you two made up. I bet there were licks and belly rubs. And don’t forget the green beans my pal! And you have style, if nothing else! You are always lookin’ good! Nice tongue. I like to stick it out where I lost a bottom tooth once….trying to grab a fence. I was successful. I’m very glad to hear you have made up with the she-peep! One big happy family again! “She-peep” – I love that! Glad ya forgave your peep! She was prolly so scared ya would be hurt by something. Ma only yells if she’s really afraid for my life…course she’s always worryin’ something’s gonna hurt me. Snort! She makes dad and me nuts sometimes. They can’t help it, Stuart. We need to remember they can be sorta crazy-crazy ’bout US that is!!! Hey, how did the groomer meet go last week? We can’t wait ta hear all about it! OH Gavin, you’re so right. Thank you for reeling me back in on this one. Running away was bad. BAD. I’ll tell you all about the grooming visit. ArOOOOO! I had paws crossed that you would forgive your peep! Like they say, “To err is human; to forgive divine.” You should feel proud, Stuart, that’s what a gentleman does. Good job! And you KNOW I’m a gentleman. Forgivin her are probably a good idea since she controls da food supply. OH yes…and the space in the BIG BED! At least we know that you can move when you want to move. Everything on your own terms. As it should be, yes? You know what? I DID stamp my feet at her the other day! MUCH, much better. Thanks, pal! Stu, We aroooo sooo HAPPY you forgave your Peeptress! Your watercolor today is so cute with your little pink tongue hanging out and you looking quite Royally Coifed! You’re the Cutest Prez Candy-date we has EVER seen! Swoon! Just remember, sometimes Royalty has to adhere to decorum. We know its tough for you, your Majesty, but you must admit you are always catered to by your adoring Peepstress and you get to do exactly what you want to do 99.9999% of da time, n’est-ce pas? Mais, Oui! If you want company with how Royals feel restrained at times, just watch “Roman Holiday” with Audrey Hepburn. Just please don’t get ANY ideas about going on a Roman Holiday of your own this close to your candy-date nomination for Prez…you ARE already KING, you know. You mustn’t disappoint your adoring subjects! We would be so sad if we lost touch with you while you were on the lam under a false identity, although we knows you’d come back home, because you have it so good in your Palace, but we’d worry about you, and your Peeptress just would not be able to face a minute without your Royal YOU! But, CAN I RIDE THE SCOOTER????? LOVE THAT MOVIE! Dat is our fav movie too!